Programmable Thermostats – Morrison Inc.
With the Wi-Fi VisionPRO, you’ll get comfort, convenience and connectivity. Using an existing Wi-Fi network plus Honeywell’s free Total Connect Comfort services, the Wi-Fi VisionPRO allows you to remotely control your comfort settings and manage your energy costs – with ease. 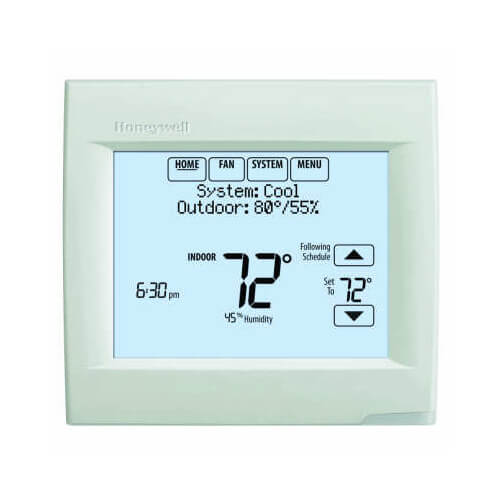 Remote comfort control via computer, tablet or smartphone – easily monitor and manage home comfort from any device, anywhere with Honeywell’s Total Connect Comfort app. IAQ Control – Indoor humidification, dehumidification or ventilation control without requiring an outdoor air sensor. Built-in Ventilation Controller – Lockouts for temperature and humidity prevent pulling in hot or humid air. No extra ventilation controller or remote sensor needed.